LLBLGen Pro v5.5 is here! Trusted by over 7000 companies in over 100 countries worldwide. The LLBLGen Pro Runtime Framework is best-in-class for cloud-based apps, due to its low-memory, high performance characteristics. .NET Core or .NET Full: your choice. No designer on the market lets you work as effortlessly with Entity Framework and Entity Framework Core class models as LLBLGen Pro. The LLBLGen Pro Runtime Framework offers the rich set of features needed for today's Line-of-Business development: powerful auditing, authorization and validation functionality as well as async/await, linq and flexible databinding support. The Derived Models feature offered by the LLBLGen Pro designer allows you to create DTO class models based on your entity model, which are ready-to-use in your WebAPI/(micro)service. LLBLGen Pro is the leading entity modeling solution for .NET and can be used with Entity Framework Core or Entity Framework Full, the LLBLGen Pro Runtime Framework (included), NHibernate and Linq to Sql. It lets you easily define your entity model and map it to your database so you can get started writing queries right away. 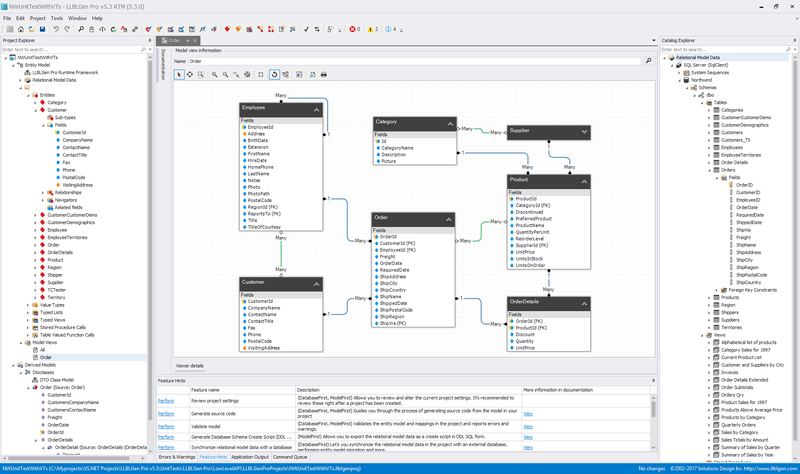 The Designer is the best choice for working with the major O/R Mapping frameworks: Entity Framework Core, Entity Framework Full, the LLBLGen Pro Runtime Framework, NHibernate and Linq to Sql. It's flexible, allowing you to configure any aspect of the mapping workflow. It's robust, designed to handle models with thousands of entities. Tools you can rely on, because your clients rely on you. The time a developer used to spend on repetitive tasks is eliminated, doubling productivity. This means projects can be completed on time. The designer and our framework are designed to be open, flexible and extensible so they meet the way you want to work with entity models and your data. In-depth experience with data-access and entity-management makes the LLBLGen Pro team the right people for doing the job of writing Data Access and Business Objects tiers. The code generated by LLBLGen Pro is mature (on the market since 2003) and has been tested thoroughly, making the appearance of bugs virtually non-existent when compared to situations in which the 'plumbing' is written manually. Prices are per seat and exclusive of VAT and handling costs. An LLBLGen Pro license comes with the LLBLGen Pro Designer, the LLBLGen Pro Runtime Framework, full support for Entity Framework, Entity Framework Core, NHibernate, and Linq to Sql, ORM Profiler, and extensive documentation. Volume discounts for LLBLGen Pro are available if you purchase multiple licenses at once. See the table at the right for the price bands. The correct total amount for the number of licenses you purchase is calculated automatically on the order page.